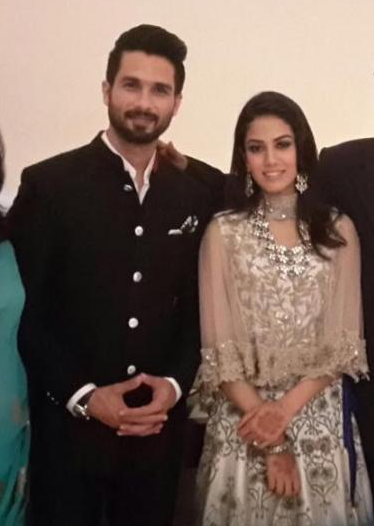 The hottest new trend on the block, capes were brought into the spotlight as serious wedding-wear when Shahid Kapoor’s bride, Mira Rajput, wore an Anamika Khanna cape for their Delhi Reception party. Rahul Mishra, Jayanti Reddy, Ridhi Mehra and Taniya O’Connor are some of the designers who’ve created lust-worthy capes. The dhoti is back in style, and what a comfortable style it is! Sonali Gupta and Ridhima Bhasin are two designers who’ve done a great job with the silhoutte, giving wedding guests and brides some fantastic designs to pick from. 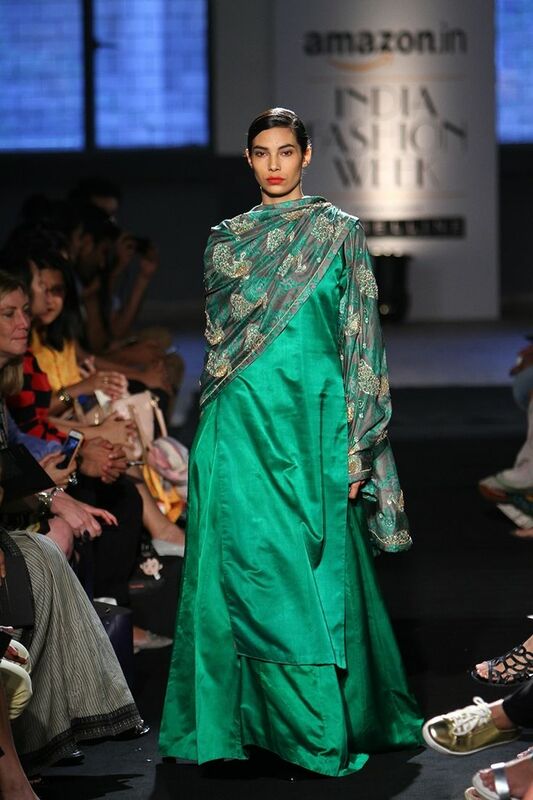 The dhoti style has found itself a place in sari-drapes as well! And of course, Sonam Kapoor is our go-to guide on how it’s done right. 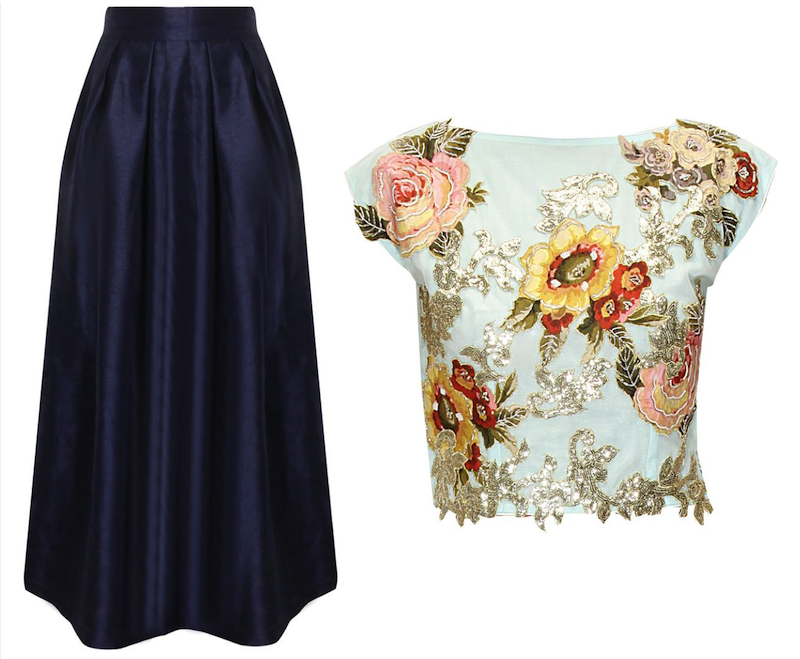 Crop tops that double up as blouses, and maxi skirts that are used as lehengas – multi-tasking fashion is officially here. And I predicted it almost a year ago 😉 These are PERFECT for a bride to wear to her Mehendi (see more Mehendi outfit options here) or for the bridesmaids to wear to smaller functions. 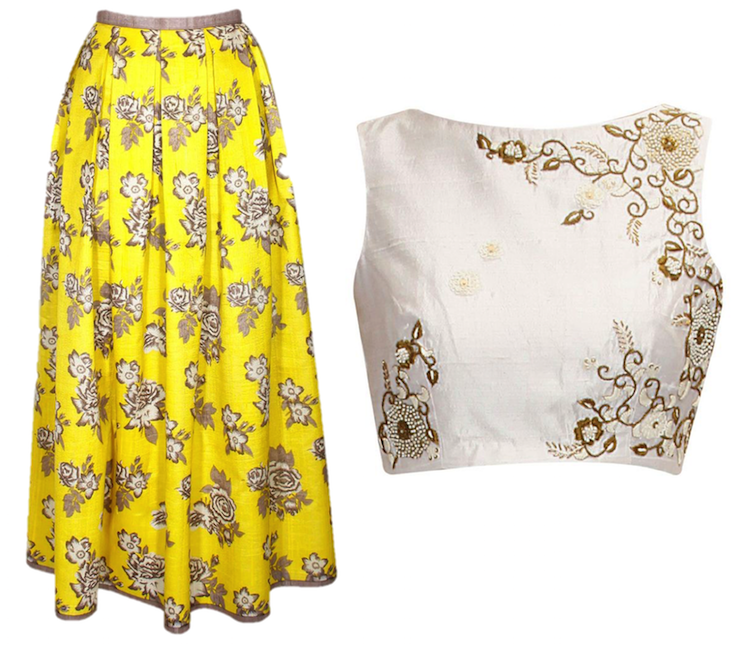 Eshaani Jayaswal and Ridhi Mehra make my favourite crop tops, while Mogra, Sonali Kalra Ahuja and Nitya Bajaj have created some fabulous maxi skirt designs! I was not particularly a fan of this style, till I saw Kareena Kapoor smash the look in this wedding guest avtaar recently. No dupatta, 1 statement necklace, and a clutch that complements – she nailed it! Fitted, flowing, flared. Short, long, sheer, open, closed. Doesn’t matter how you love your jacket, because it’s all good. This is definitely my absolute favourite style, and I’m particularly a big fan of pairing these babies with cigarette pants (Anita Dongre & Bhumika Sharma), and the bomber-jacket with lehenga look that’s been on the runways this past year (Rahul Mishra & Monisha Jaising). Basically, a kurta with an asymmetrical cut in front. High-low has been an international trend, and just like capes took on an Indian avtaar seamlessly, asymmetrical designs moved from dresses to kurtas. If you detest anarkalis, and are bored of your straight-cut suits, a draped kurta is a great way to liven up your wardrobe. It may sound like a vague term, but it’s a great option for anyone wanting to add an interesting piece to your wedding wear closet. The designers that got me hooked onto drapes? Tisha Saksena and Saumya & Bhavini Modi. If you don’t want to steer too far away from, what I like to call, “normal clothes”, you can use a few little details to add a slight twist to the normal kurta. Similar to short kurtis and patialas. Did I miss out on a silhouette? Leave a comment about what you love to wear to weddings! Totally agree about anarkali everywhere..enough already! My faves would be the kurtas with the side splits and the capes. 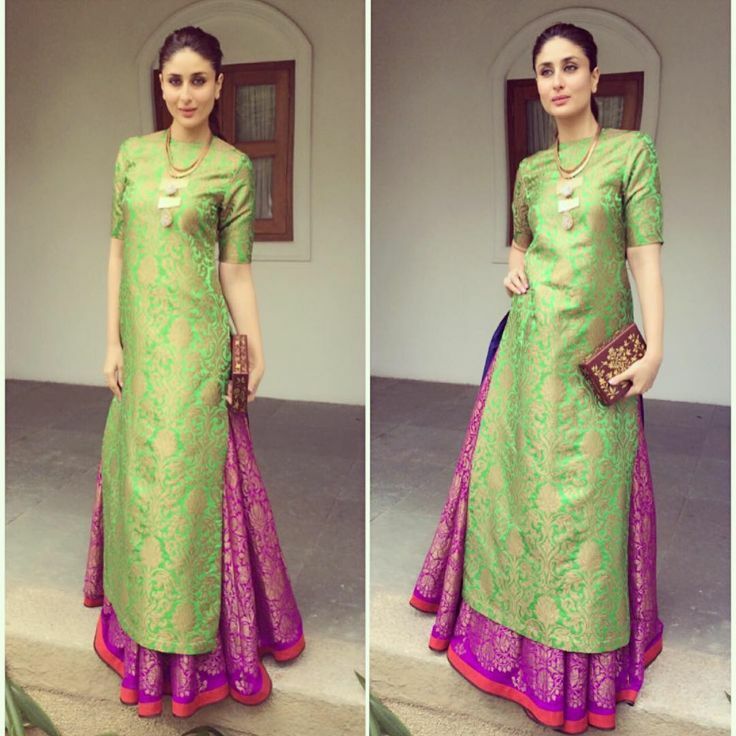 Also like you – I loved the way Kareena wore the long kurta and lehenga. She made it look awesome and effortless. Nice compilation Shinjini. 🙂 I have also covered some of these styles on my blog- namely DIY capes, shararas, crop tops and skirts, jackets, uneven hems and DIY kurta. I know this looks very self promotional 😉 but you readers might be interested I thought. Can you please tell me where in Delhi will these outfits be available? Will they be available in Amar Colony or Lajpat nagar market? Where can I purchase a cape? The ones you have on this post are so beautiful! 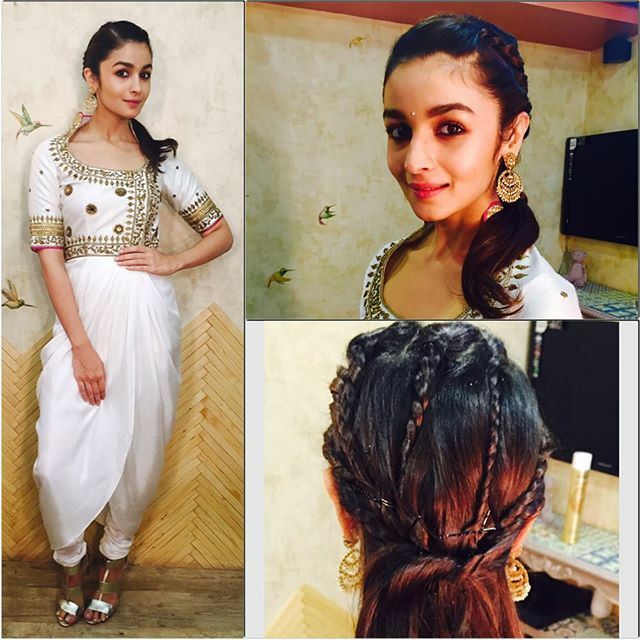 I really liked the Dhoti pant, idea, it’s innovative and new trend! The whole anarkali thingy is so true. I have my brother’s wedding coming up soon n everyone is hell bent on suggesting me anarkali’s n its just too annoying. I was desperate for a change n your article did just that. There are many options n am so happy I came across this. Thank you so so much!! 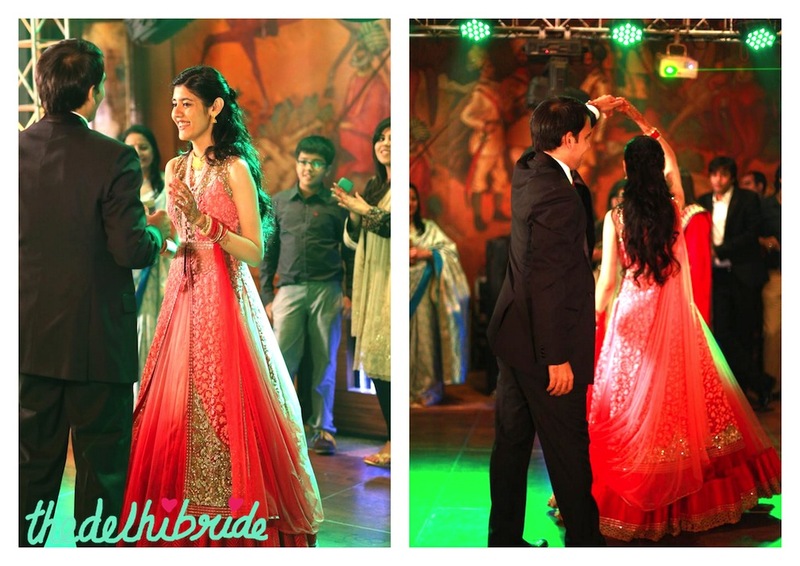 Next article thedelhibride Asks… should Matha Patti & Nath not be worn by wedding guests?